Exclusive: How its new price construct really works. NBN Co is set to divide its customer base into two classes in October: those who can afford to pay for a higher minimum standard of service, and those who can’t. The company’s retail service providers - particularly those that have a lot of 12Mbps users - face being caught in the middle and are already bracing for a backlash. The situation came to light in part because NBN Co finally released technical details [pdf] of a new permanent price construct it announced late last year. They contained a surprise: setting a new minimum wholesale cost for an NBN broadband service at $45 a month, regardless of whether the service is 12Mbps, 25Mbps or 50Mbps. Pricing a 12Mbps or 25Mbps service the same as a 50Mbps service was never part of the original announcement in December last year, meaning this was added during a closed-door consultation between NBN Co and its retail partners. It is unclear who pushed for it, as it has upset some retail providers and NBN Co has not commented on it. Existing 12Mbps and 25Mbps customers won’t face price rises for NBN services because they can stay on their existing plans. But in doing so, they won’t receive the performance improvements that customers on the new price model get. In addition, their internet performance - particularly during the evening peak - could regress to pre-December 2017 levels, when NBN users routinely complained about slow speeds during busy hours. An NBN Co spokesperson told iTnews its focus is on "working with RSPs on migrating customers currently on 12Mbps services to higher speeds, so they can obtain a significantly improved NBN experience". Those left behind on the old price model will have to rely on a change of heart from NBN Co, though aside from some outstanding “industry discussions” there is no option on the table to prevent them from falling on the wrong side of the performance divide. NBN Co is in the midst of changing the way it charges for services. From October this year, internet providers can use either the old or new price model to base their plans on. Under the existing price model, internet providers pay two fees to NBN Co: a cost for each service (aggregated virtual circuit or AVC) and a bandwidth charge (connectivity virtual circuit or CVC). The cost per service is $24 a month for a 12/1Mbps user, $27 for 25/5Mbps and $34 for 50/20Mbps or equivalent. The separate bandwidth charge offers staggered discounts based on how much a provider buys. The high price of that bandwidth charge traditionally dissuaded providers from buying enough and so the performance of services - particularly in the 7-11pm evening peak - suffered. The new price model changes this. It is a single charge that bundles the service cost with a minimum amount of bandwidth. It is designed to guarantee each user a better standard of internet performance over the NBN. A temporary offer modelled on it - called ‘Focus on 50’ - proved as much, raising the bar generally and even leading NBN Co to declare in March that its problems were over. In reality, the new model creates a new set of problems. First, the $45 basic wholesale charge will prevent RSPs from upgrading their existing 12Mbps users over to the newer pricing model. “We have many customers on 12/1 who have no intention to pay more than $60 per month and therefore we just cannot move them to the new [construct] where wholesale costs begin at $45,” TPG’s chief operations officer Craig Levy confirmed to iTnews. Customers can stay on their existing 12Mbps plans, but in doing so they miss out on the better speeds - particularly during the evening peak - that the new pricing model promises. This will create two classes of NBN user. One class, on the new price model, will be guaranteed a minimum of 2Mbps of CVC capacity. The second class of user, on the existing price model, will continue to have no set minimum amount of CVC being provisioned for them. History isn’t in their favour; before December last year, internet providers barely provisioned an average of 1Mbps per user per month. Table source: Compiled by iTnews. The two classes of users are likely to see very different NBN performance, based purely on their ability to pay an unexplained new uniform wholesale charge. It is unclear why a bundle of a 12Mbps service with 2Mbps of CVC costs the same at a wholesale level as a 50Mbps service with 2Mbps of CVC. It appears to be designed to discourage RSPs from selling more 12Mbps services; NBN Co wants 50Mbps to become the new default standard on its network. But it also acts as an ultimatum for the almost one million 12Mbps users already on the network: a choice between price and performance. If they want better performance, they will have to pay more to get it. Aussie Broadband managing director Phil Britt said he believed customers that chose on price would wind up “with higher levels of contention” - or in other words, slower speeds. The reasons for this are best explained separately. Existing 12Mbps and 25Mbps users have indirectly benefited in recent months from a CVC bonus offer launched in December 2017. That offer ends in October this year and when it does, some of the performance gains seen in recent months are likely to go with it. The bonus was part of a temporary price offer known as ‘Focus on 50’. It was designed to allow RSPs to sign up new customers and shift existing 25Mbps users to 50Mbps, where NBN Co promised they would see better speeds and performance. Focus on 50 tries to replicate the new price model but in a way that can be implemented using the existing price model. RSPs received a cheap deal on the AVC cost (effectively a 50Mbps service at a 25Mbps price) and 50 percent extra CVC for free, based on the amount they purchased. Due to the way the NBN works - where all traffic exchanged between the RSP and NBN Co runs over a single CVC interconnect at each point of interconnect (PoI) - the bonus benefited all of an RSP’s customers, not simply those who bought the new 50Mbps plan. However, this changes once the new price model arrives. 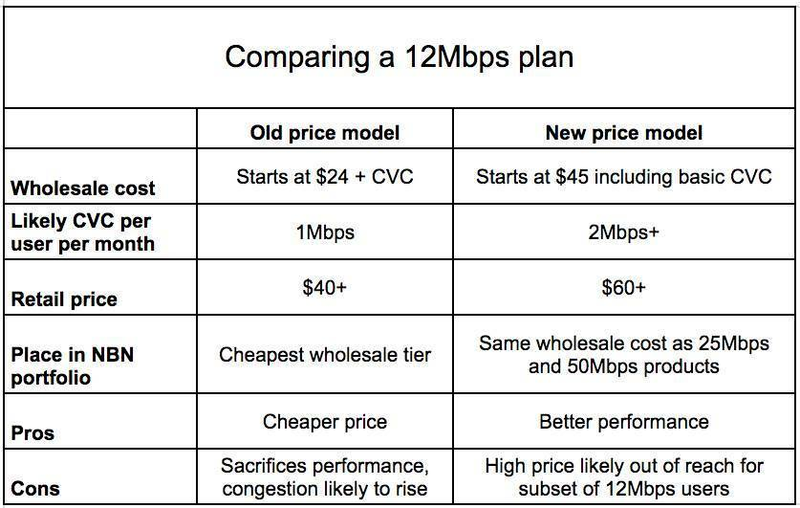 Because of the different structure of each price model - one with bundled CVC capacity and the other without - RSPs will need two CVCs, not one, for every NBN PoI. One CVC will serve users whose plans come bundled with capacity, the other CVC will serve users whose AVC and CVC charges are still separate. This is effectively the network construction for the two classes of users. When 50Mbps users are shifted to the new price model (and new CVC), they take their performance boost with them. Consequently, unless RSPs suddenly decide to pay to maintain the CVC boost they have been getting for free, 12Mbps and 25Mbps users will lose some of the gains they’ve seen over the past few months, and once again face increased congestion. “End user perception will once again face peak evening slowdown unless NBN Co come up with solutions for the 12Mbps and 25Mbps products,” Levy said. “Until now they have been silent on new generation 12Mbps pricing but these access speeds make up significant numbers and in truth those customers will go back to pre-December peak evening experience because the CVC costs will reset and this means RSPs will not get the 50 percent extra boost that 12 and 25 access tails benefit from today. The mid-term future for price-sensitive or lower usage users remains largely unclear. Between now and October, RSPs essentially don’t need to take much action, and most aren’t - given that speed bonuses continue and 12Mbps and 25Mbps users continue to benefit. That being said, there is confusion even among the largest RSPs about how to approach the changeover. Several RSPs told iTnews on condition of anonymity that it was still too early to detail how they would serve the two sets of customers. Unless concessions can be wrung out of NBN Co in the next few months - or RSPs agree to buy a lot more bandwidth than they have historically - they face a world of hurt when they have to start separating customers between the old and new price model. “The migration exercise of having to build new CVCs and migrate new bundle customers is a real life horror about to unfold unless NBN Co thinks up a smarter approach to address the shortfalls of their new bundle rules, which were designed due to NBN system limitations,” TPG’s Craig Levy said. “They [NBN Co] did not really need to take such an approach. They could have fixed their systems and not passed the problem to the industry. “We will continue to work with NBN Co so we can find another approach but the clock is ticking and October is near. What happens now will depend on NBN Co’s overriding concern. The network builder’s focus around pricing to date is designed to benefit large users on higher-speed plans: the kind of users that would help NBN Co raise its average revenue per user (ARPU) and look profitable. There is an open question about the effect on the public or social good that NBN Co’s decisions around 12Mbps pricing might have. ACCAN - which has long campaigned for better broadband affordability, particularly in an NBN world - told a parliamentary inquiry last year that high prices could keep users from benefiting from a growing range of online services, such as in health and education. The only real option on the table right now is the promise of an entry-level wholesale bundle that NBN Co outlined in December. As it currently stands, this bundle would not help 12Mbps broadband users much, since it is proposed to be speed-limited to just 56Kbps. But even up until the time of publication, NBN Co pitched the product as a path to ensuring “voice-only and basic broadband access customers are not left behind”. “The new voice-only and low usage access plans were proposed to come with an included 50Kbps of data, which is enough to cover a basic telephony service,” an NBN Co spokesperson said. “This means retailers servicing telephone-only and basic internet users can purchase the new NBN12 bundle for a wholesale charge of just $22 per month, which represents a potential discount of around eight per cent on the current entry-level plan. A more intriguing option being pushed by both Telstra and Optus is to not treat the new pricing model as the endgame but rather as an interim step on the path to something better. Telstra CEO Andy Penn called for even deeper changes to NBN pricing earlier this month. Optus has now more or less joined the same camp. "Recent changes to NBN Co’s pricing are a welcome step in the right direction and have helped to address customer experience issues in the short term," an Optus spokesperson told iTnews. "However, given the growth in data consumption further wholesale pricing changes will be required to avoid any future adverse impacts to customers. "Optus encourages NBN Co to engage in further industry consultation on a longer-term, more sustainable wholesale pricing model."